Experience High Desert Living! Southwestern-style home on spacious 5.0 acre home site. 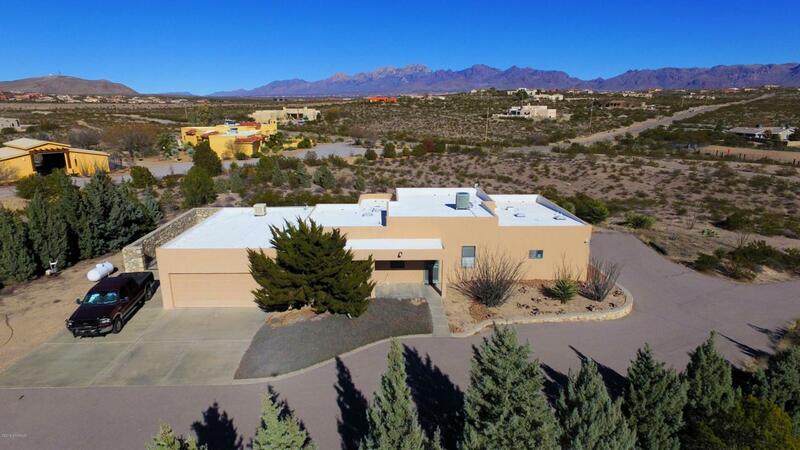 Broad panoramic views of the Organ Mountains & Mesilla Valley. 3 BEDROOM, 3 BATHROOM, approx 2,027 sqft. LIVING ROOM features large picture window on view side, custom flooring & ceiling fan. KITCHEN offers eat-in dining area, wood cabinetry, BOSCH dishwasher, electric range & skylight. Huge MASTER BEDROOM with fan. Double MASTER BATHROOMS with tile flooring, walk-in closets & skylights...one has a jet tub & other has a shower. Tiled FORMAL DINING area. Full Hall BATH with tile flooring & tile tub surround. UTILITY ROOM with extra cabinet storage. OVERSIZED insulated 2-Car GARAGE/WORKSHOP (approx 817 sqft), has it's own evap cooler & utility sink. Comfortable refrigerated air/security system/water softener/upgraded built-up roof. Covered BACK PATIO with swing, water feature & Pergola. Horses allowed, lots of possibilities for your corral/barn & places to ride! Ask about Buyer Credit with acceptable offer! !